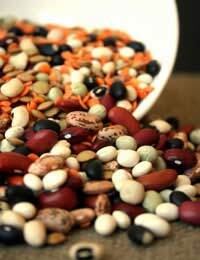 Dried beans – chickpeas, kidney beans, butter and borlotti – are worth keeping in your cupboards. A packet of dried chickpeas, for example, is very cheap and extremely nutritious. Vegetarians eat them as a substitute for meat proteins (combine with rice or other grains and dairy for best nutritional value). Try one of our pulses recipes – they’re not just cheap, they’re cheerful too! Dried beans must be soaked overnight in cold water before cooking – to shortcut this step, buy tinned beans that are cooked and packed in brine. Butter beans are plump and creamy - the perfect introduction to pulses. Many recipes match butter beans with olive oil or cream for a luxurious finish. This baked bean recipe is delicious alongside fish or chicken. Start the butter beans the day before you want to eat them. Put the dry beans in a large pan and cover very generously with cold water (they will swell overnight) then leave until the next day. Follow the instructions on the packet to cook the beans: rinse them and put into clean water, bring to the boil and boil hard for 10 minutes before simmering gently until they are tender (but not mushy). For a better result, next slip off the skins (this is not compulsory if you are in a hurry) and put the beans into an ovenproof gratin dish. Mix the crème fraiche, mustard, salt and pepper together and pour over the beans. Add the sliced leeks and stir well. Cover the dish with foil and bake at 160 degrees C, gas mark 3 for 30 minutes, removing the foil during the last ten minutes if you want to brown the top. Lentils come in different colours: red, green, brown, and yellow. They are smaller than beans and suitable for substituting mince in recipes. For example, use green lentils – which hold their shape – to make a lentil Bolognese. Cooking lentils is easier than cooking pulses because you do not need to soak them overnight (except for yellow split peas). Just pick over the lentils for discoloured ones, then rinse and drop into boiling water. For extra flavour, add a stock cube, chopped onion, garlic or herbs to the cooking water. Then cook for around 30 minutes – or as instructed on the packet. Red lentils disintegrate during cooking, so they are more suitable for recipes such as veggie burgers, soup or stew. Warm a large saucepan and put in the onions, garlic, ginger and curry paste. Stir over a low heat until the onions are soft. Add the chopped carrots and cook for a further two minutes, then stir in the dry red lentils. Keep stirring until the lentils are coated in oil, then pour in the stock. Bring to the boil, then reduce to a gentle simmer, cover loosely, and simmer the soup for 20 minutes. Check that the lentils are soft. Then you can serve the soup as it is, or blend until smooth. Garnish with yoghurt and fresh chopped coriander.